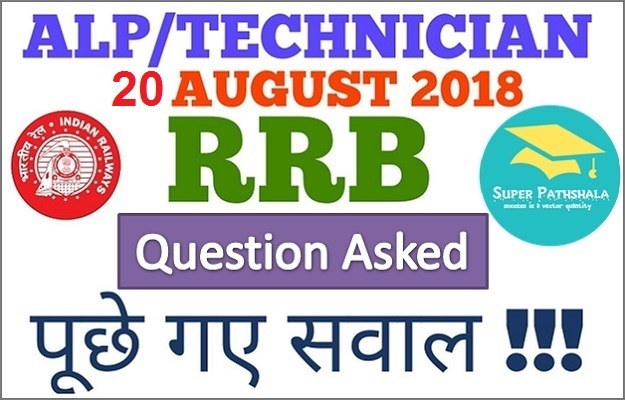 Hello Aspirants, Today we are sharing RRB ALP Questions asked 20th August 2018 All Shift 1, 2 & 3. 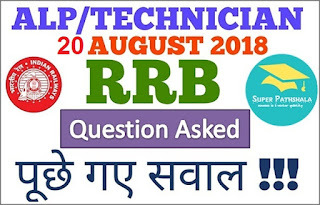 Here you will get the all question asked in 20th August 2018 in shift 1, 2, & 3 from General awareness and Current Affairs, General Science, General Intelligence and Reasoning and Mathematics. So lets check the question section wise. Sports - Who won French Open 2017? Who is CEO of Master Card? Politics - Who won best CM of the year? Who is CEO of Nokia? Full form of Pan Card? Who wrote "Sita The Warrior of Mithila"? Who was the runner up in under 17 FIFA world cup 2017? Which Indian gave a tabla performance in the Silk Road Summit? Statement & Conclusion - Some Cat is Rat, Some Cat is Monkey. Who is CEO of Flipkart? Trigonometry - If SinA + CosA = a, SinA - CosA = ? If incidence makes an angle of 30 degree, then what will be the reflection angle? Life Science - Which Vitamin deficiency caused Blood clot? 5 men or 10 woman does a work in 20 days, then 3 men and 4 woman will complete the work in how many days? Percentage - 46% of 250=? Note: If you appeared for the exam, please share more questions in the comments section below & help students who are yet to appear for RRB ALP Exams. Sharing is caring. Stay connected with gradeup and boost up your preparation for the upcoming examination.